Ready to get started? Roll up your sleeves and let’s write some code. Note that I will not go over the entire code base in this tutorial – just the meat of the logic. First we need to make sure we have a gallery to connect to. 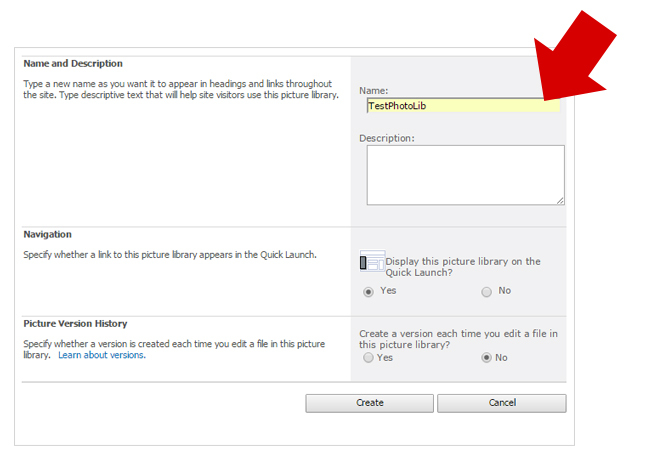 In SharePoint, you do this by going to “View All Site Content” and adding a new Picture Library. 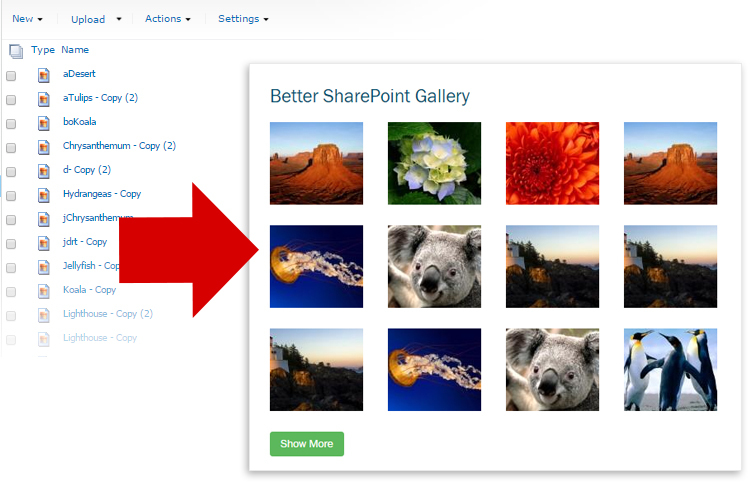 Note that for this demo I’m using SharePoint 2010 – I believe in newer versions you have to “Add an App” > “Photo Library”. Upload some images to your newly created library. Now we can continue and pull our images in the front end. Create a Javasript file and name it sp-gallery.js. You can place it inside any SharePoint document library – and simply map to it using Windows Explorer so you can write to it just like you would as if it was a local file. Let’s setup the wrapper for our gallery. We’re using the “Revealing Module” pattern so we can have methods that are public and private, as well as we keep our logic real tidy. We’re adding private variables inside our class so we can use it all over our code. The above will return a “promise” object that we can use to manipulate later on. In the case above, it’s simply a number. This method is the call to grab our list items. Again, we’re using jQuery’s “Ajax” method, returning a promise object. Also note that I’ve added a “popup” functionality which we’ve instantiated in the code above. We’re using magnificpopup.js for this awesome feature. We’re only loading a certain subset of photos in our gallery. We will have a button in the bottom of our images that when clicked, will do another fetch to our list and add them below. Again, this is public, so it’s a “function expression”. This sort of acts like an “infinite scroll” functionality – but with a button. I’m not particularly fond of that automatic loading. Now that our methods are in place, it is time to tie them all together and returning them so we can call them outside of our class. We do this by creating an “init” function. We will use a “findGroup” helper inside our templates so we can “group” our photos together. This is what our “Magnificpopup” plugin requires – so when you click “next” or “previous” – it knows which photo to show. The “imgSrc” helper simply returns the source of the images, while the “imgSrcThumb” returns the thumbnail path. Note that this helper only supports jpegs at the moment. I’ve also added extra “col” classes for my own grid styles when the viewport is decreased. Also notice the .mfp classes are necessary for our magnific popup to work “magnificently”. The above contains the references to the files we need. We went ahead and create our gallery and pass in the name of our Photo Gallery above. We then initialize and add the “showmore” handler when our button is clicked. The above template is what we need for our gallery to work. This code represents each tile that we will produce in our gallery. Save this text file (along with the .js and .css) and add it to any SharePoint page. Add a Content Editor WebPart, and add a link to an external file – to our .txt file. I usually edit the webpart to “NOT” show the chrome. A simple photo gallery with popup and paging functionality. It surely looks better than the “out of the box” photo gallery that SP provides. Furthermore, you have complete ability to change the look as much as you want. But the real value is the introductory lesson to working with SharePoint’s REST api. Be sure to stay tuned for more stuff like this. Leave your comments below. is it possible to show it folder by folder and not displaying all the photos? Not with the current setup. This is really great, could you help me generating the pictures please, right now it’s generating blank thumbnail because the path is incorrect, I’m getting this /site/sitename/site/sitename then then the filename. I’m also missing the .jpg extention on the thumbnail part, I’m seeing undefined instead of .jpg. 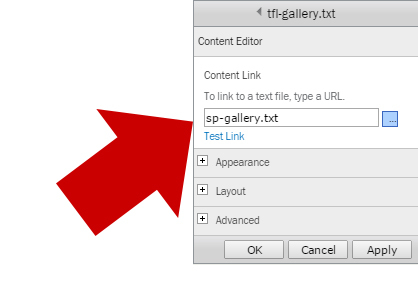 Did you not forget to link to your css file somewhere (in sp-gallery.txt for example: there is already reference to the sp-gallery.js file there) ? I found that the sp-gallery.txt on your github page does reference all the necessary files…just not the code on this page. It is me again 😀 With more problems with new functions. So your code is generating an all white page where there are white scuares that are tumbnails, I can see the urls to images when hovering. When trying to click on any area that is supposed to be an tumbnail (not screated but area is) the /site/sitename/site/sitename issue is thrown at me. I tried to get around this but the images are linked that way no mather what. Press F12 – and look under “console” – you should see where the code is trying to pull the images. Just verify if this path is correct. Your API url seems unreachable (404). Make sure you’re doing the right call to the right endpoint. shellplusg2m_73d3a900.js:29 Failed to execute ‘postMessage’ on ‘DOMWindow’: The target origin provided (‘https://portal.office.com’) does not match the recipient window’s origin (‘https://login.microsoftonline.com’). Any suggestion to fix it? I’m using SharePoint Online. this is an error in handlebars – so try to debug even before compiling the template. My hunch is some of the items do not have a value. Seems to work after a page reload but not at first post. Any ideas? Did anyone get a solution to this? Is magnificPopup.js included in your page? I replaced the line “return url” in .JS to “return url.replace(‘/sites/photos’,”);” (photos is my sitecollection) and now it works. And disabled SharePoint Minimal Download Strategy that can make troubles. Yes, Minimal Download Strategy has a lot of “quirks”. Never mind I got it working. Seems like a bit of a hack, however. Any way to remove the duplicate string in the code? Thanks for your great work for this beautiful Gallery. How can I create this REST-endpoint script including in your script? Every other resource is available locally. What they’re referring to is writing it in c# – which is not covered in this tutorial. This is all front end code. Or you add more permissions to your gallery. It is also adding an extra two levels in the image URL (duplicating the first and second level folders)? Also, looking at the code – it’s just looking for “jpg” – so stick to jpg files for now. I will update the code to do “png” and “gif” asap. I’m looking at the duplicate levels issue. Michael, seems like this post has long been inactive, but I’m trying to implement this now, and running into the duplicates issue. Any progress on finding a fix for this? How do I get the value of the variable Michael? My console is just displaying a GET error when trying to find the image. Also, my library is definitely a Picture Library but is not generating thumbnails automatically? After I setup all the things in the sharepoint – changing the js,css and sp-gallery.js path. and put the text file to the CEWP, the only thing that came out was the square outline of the picture box (got 4 picture in the gallery). Therefore, the web show 4 square box with no image in it. well nothing change..it still show the same url with that duplicate subsite. view your webpage using Chrome and open the console. this will show you what’s going on – usually for broken images – it will show you where it’s looking, and you figure out how to fix. Michael I am getting a similar problem. The Chrome console is telling me it can’t find the thumbnail in the “_t” subfolder – do I have to generate thumbnails some how first? inside the helper, then do a refresh on the webpage and see the console. Yes, data.path is always “/sites/mySite/myPictures” thus adding the doublicate site. Another question: Are you planning to add folder support? Would be awesome to use that clean gallery together with folder navigation. I am getting the same issue, did you manage to resolve it? It shows ‘gallery’ is undefined. Had queries in sequence of code and braces. Will it be correct or the brace for var gallery needs to be closed before?? Thanks for the awesome post. Can you please let me know how can I create a photo gallery which shows only black color as thumbnail and after clicking on it, it redirects to respective document library with different color icon. Thank you for this wonderful! This is my first rest app and was able to use it in SharePoint Online.